Returning to the Mission District from the streets of Italy was an easy transition. Latino culture has a strong American indigenous character, but as the word Latino implies, it also shares cultural roots with Italy. Ever since I lived in Italy, in the late sixties, I've been aware of the difference between northern european cultures which dominate the United States and the southern Latin cultures. One of the most salient aspects of Latin culture is the extent to which it takes place on the street which makes it of particular interest to an outdoor painter. Family, community and self-expression, in all its forms, have a higher priority in the Latin world. This means that I am as warmly welcomed painting on the street in the Mission as I was in Italy. It also means that I hardly ever have to search for models. Volunteers often step forward when I need them. 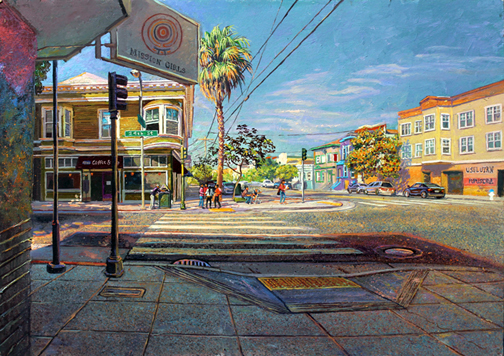 As Roberto, from El Salvador, did when I needed a figure crossing the street in this painting. I've met so many interesting people that I plan, next year, to shift some of my focus from cityscapes to street portraits. Gentrification remains the paramount issue in the Mission.The Day of the Dead celebration on the evening of Nov 2 was even larger than last year's. It included several floats. One of which halted at Harrison and 24th street while a gentleman, on the float, gave an impassioned speech. Citing one landlord's attempt to evict a 99 year old woman who has lived in the Mission for over forty years, he implored the crowd to respect "those who care for your children, prepare your food, clean your homes. We have a right to live in our own community." An unfortunate corollary of the demographic shift in the Mission, is that many locals feel they are being racially profiled by newcomers who stereotype them out of cultural ignorance. Eight months ago there was a brutal police slaying of a young Latino, Alex Nieto, a full time scholarship student at CCSF. Someone in the neighborhood had called the police because they had seen "a Latin male adult with a red jacket, black pants and a handgun on his hip pacing near a bench on Bernal Hill" Alex was eating a burrito before he went to his job as a security guard. The 'gun' on his belt was a clearly marked Taser. He was shot fourteen times and killed. Witnesses reported that he had provided no provocation. Alex was remembered with his own room at this years' Dia de los Muertos rooms for the dead exhibition at the SOMARTS Gallery. Titled "Visions at Twilight: Dia de los Muertos 2014" the show was curated by artist and activist René Yañez and his son Rio. Renee, who also faces eviction, had this to say about the exhibition. Arriving a little late for the opening of the exhibition, my wife and I were delighted to catch San Francisco's poet laureate Alejandro Murguia's riveting delivery of poetry and reminiscences. Pacing the stage with the alternating prance of a panther and strut of a peacock, he eloquently evoked the colors, sounds and textures of the Mission of his youth. He performed without notes in the tradition of great oral poets.